Okay! So where do I start with this one? 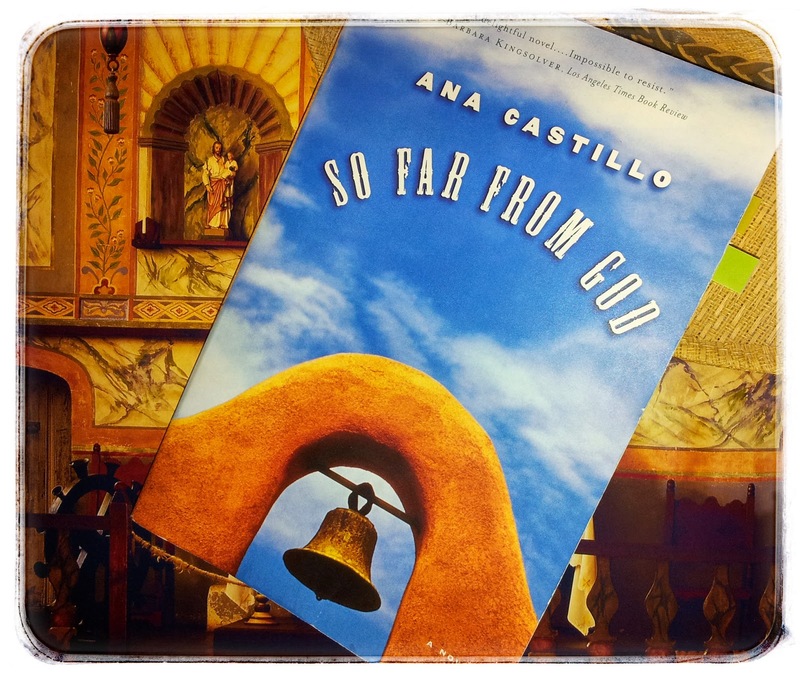 So Far From God, by Mexican-American Chicana author, Ana Castillo. It’s the book I intended to read years ago for an ethnic American literature class, but shamefully never did. Nonetheless, I held tightly to it for a rainy day. It takes place in a New Mexico town called Tome. It’s here that we're introduced to mother and wife, Sofi (short for Sofia), and her four, emotionally dented daughters, Esperanza, Caridad, Fe, and La Loca. Oh, that’s not to mention Sofi’s “five dogs, six cats, and four horses.” Upon her introduction, we learn that Sofi’s marriage is on the rocks. Her husband walked out on his family years ago, leaving Sofi to raise her four girls alone. This is sort of the cornerstone to the attitude/theme of the book as well as the relationships between the female and male cast. 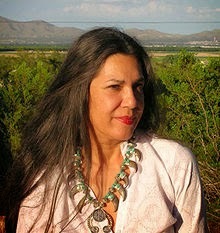 It’s a book that illustrates how a Mexican-American woman/wife (much reflected in the author and her own career as an activism for Chicana feminism) can gather the strength to inspire a social campaign that defies the conceptualizations of any man’s view of a woman's presuppose “role” as wife and mother. However, Sofi’s activism doesn’t arise without devastating lessons used to shape her agenda. Many of which revolving around the fates of her four daughters. I have to say that I really enjoyed So Far From God; four out of five stars seem sound. Nonetheless, the truth is that I kind of struggled with it in the beginning, to the point where I was about to exchange it for something else off the shelf. However, in its finality, it was a great read. I’m glad I stuck with it until the end. See, it started off powerful enough, with the first chapter dedicated toward introducing Sofia and her four girls to readers. Furthermore, that first chapter showcased the magical realism used to illustrate how Sofia’s youngest daughter, La Loca, suffered from a seizure that sent her to her grave and back to life. Though she’s severely antisocial, her coming back from the dead has given her a status similar to a town magnus. And one that her family is extremely protective of. So yes, that was the first chapter. One that was great for taking in Castillo’s direction, and her use of magical realism with Mexican flavor. But then Castillo moved into deepening the character of the middle child, Caridad. Things got slightly rocky with the sudden thrust of a combined use of Mexican myths and folklore, religion, psychic powers, and a spontaneous laundry list of traditional remedies (that’s never used or considered again within the novel) for ailments such as gastrointestinal blockages. It all came careening through all at once, kind of leveling away the focus. Later, once all of these wonderful elements were woven into the stories of the characters, everything seemed manageable to the reading experience. However, rushed so soon into the book kind of begged for a peek at the novel’s direction. Therefore, it took me a moment to get into the momentum of the book, and the actual charm of it all featured in the individual stories of Sofi’s four daughters. Everything from the folklore to the traditional medicines colored So Far From God once you adjust to it, but what really made this book worthwhile is the stories of Sofi’s four daughters who carried those elements. The eldest, Esperanza, is the hyper-responsible one with a career in journalism that eventually sends her to Saudi Arabia. Next in line comes Caridad. She’s the daughter known as the beauty of the quartet, and the one who gathers the most attention from men. She's also the one who eventually comes to question her sexuality, after surviving the assault of a "demon." Novel wise, she’s the daughter who received the majority of “screen time" and character development. The third daughter is Fe, who was probably my favorite. She’s the daughter who works as a banker. She’s also the one who suffers from a mental breakdown after her fiance abandons their engagement. Eventually, slowly, she learns to come back to love, although it arrives a little too late. Not to spoil anything, but I have to admit that her story was the one that moved me the most; and probably because it had a tinge of practicality and plausibility behind it. Meaning, it wasn't as fluffed with fables and folklore to color her motivation–unlike Cardid and La Loca. And while fables and folklore are perfectly fine, the truth is that Fe’s story seemed so real that I actually cried at its conclusion. Finally, there’s La Loca. She’s the hardest sister to understand, as Castillo loads her with symbolisms related to the other three as well as Sofi. Tack that on top of her enigmatic presence, and I'll have to leave her journey to your own thoughts. The only other issue I had with So Far From God lie in how the operation of some scenes seemed muddled by lit prose and analogies. Now, I'm all good for the two, but in the case of scenes driven by action and movement, I'd rather not be hit with an abrupt punch of either to have the author’s point given across. So there were instances where I found myself re-read a scene and wishing for better structured and less poetry. In closing, So Far From God has tons to offer readers. Just as it's heartbreaking at times, it's inspirational also. The same can be said for the level of humor Castillo applies as she explores a variety of themes relating women, relationships and their need to test society's expectations of them. And those themes are even slimmer and specific as they relate to Chicana woman. Nevertheless, at the end of it all, it's the stories of the women featured in the book that is worth every bit of your concentration. I walked away from the book knowing that each of Sofia's daughters would remain unforgettable. This was a good review. Always like to hear what you think about a book. I know i am going to get the truth. I look forward to reading this arthur. Thank you. Thank you. Thank you, Denise! Thanks for reading and I hope that you enjoy this author! She's worth it! I'm ready to read more from her myself.